Ages are generally pretty incompetent at judging their own worth. How many people now would vote to bestow Nobel Prizes for Literature on Pearl Buck, Henrik Pontoppidan, Rudolf Eucken, Selma Lagerlöf or many others whose fame would barely make it to the end of their own century? Being Danish, and something of an admirer of Henrik Pontoppidan, I happen to know that the very few English translations of his work that even exist are largely abysmal. His grand novelistic trio (Det Forjættede Land, 1892; Lykke-Per, 1898-1904; De Dødes Rige, 1917) has not been translated into English, despite the fact that they were the reason Pontoppidan was so admired by Thomas Mann, Ernst Bloch, and Georg Lukács. Bearing this in mind, I can’t help but wonder what Mr. Bryson’s qualifications for his smugly dismissive remark were; unless he is fluent in turn-of-the-century Danish, or familiar with German translations of Pontoppidan’s work, I don’t think it a stretch to conclude that he has never read a word of Pontoppidan. To read Grossman in light of these discouraging numbers, however, is a cause for unremitting joy. In an occasionally polemical and highly impassioned voice, she advances the most brilliant and persuasive arguments for the absolute importance of literary translation I have ever encountered. In what she beautifully calls “the inclusive embrace,” she demonstrates how the very notion of literature would be inconceivable without translation, citing Goethe’s belief that without outside influences literature rapidly stagnates. “The more a language embraces infusions and transfusions of new elements and foreign turns of phrase, the larger, more forceful, and more flexible it becomes as an expressive medium,” Grossman rightly observes, and I can think of no better proof of this claim than the work of Salman Rushdie, whose use of Indian and Muslim languages and tradition have invigorated the English language and greatly expanded its possibilities of expression. Over and over again, at conferences and in interviews, we are compelled to insist on what is hideously referred to as the “translatability” of literature, challenged to defend our very presence as the intermediary voice between the first author and the readers of the second version of the work – that is, the translation. As Clifford Landers of the American Translators Association once said, many reviewers write as if the English text had somehow sprung into existence independently. What these same reviewers do would be iniquitos if it did not have its own kind of lunatic humour: they are fond of quoting from the translated text in order to praise the author’s style without once mentioning the fact that what they are citing is the translator’s writing – unless, of course, they do not like the book or the author’s style, and then the blame is placed squarely on the shoulders of the translator. These reproaches to translated works are familiar: undergraduate students of literature frequently encounter professorial rebukes against works of translation on account of their “unreliability.” What these professors fail to grasp is that, as Grossman recognizes, fictional writing is in itself a kind of translation, the process by which we attempt to express in writing ideas and impressions that occur to us in the indecipherable native tongue of our mind. At times, I think, Grossman’s pessimism is a little excessive (we are very fortunate to live at a time when many great translators are at work: Robert Fagles, Margaret Jull Costa, Pevear and Volokhonsky, Grossman herself), but with her insider’s knowledge of the business of translation, her criticism is no doubt warranted. In any case, there is a profound beauty and elegance of mind in her belief in the inherent goodness of translation, a vision that I hope will persuade everyone to acquire this deeply necessary, deeply serious volume. 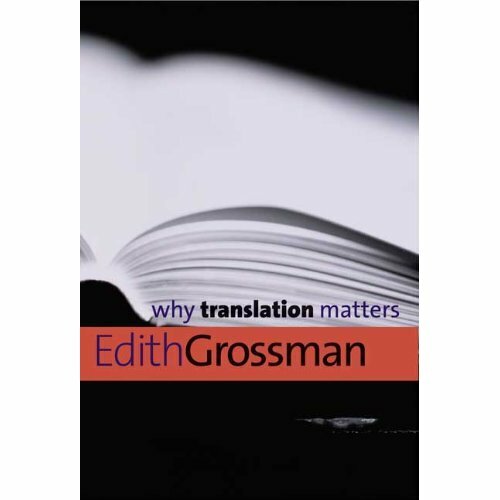 Posted in Book Reviews and tagged Edith Grossman, Literary Translation. Bookmark the permalink. Trackbacks are closed, but you can post a comment.